On April 22nd and 23rd, 2014, Saint Louis University Athletic Training students from the first and second year of the professional phase of the program teamed up to manage a scenario that simulated a football cervical spine injury that included cardiac and respiratory arrest. These students and SLU AT faculty utilized the outstanding facilities at the SLU School of Medicine's Simulation and Clinical Skills Center in an exercise to prepare for on-field emergencies. The center features high-fidelity clinical simulators which are designed to prepare health professionals in the management of all types of trauma and injury. They can be programmed to simulate many different conditions including cardiac and respiratory problems. 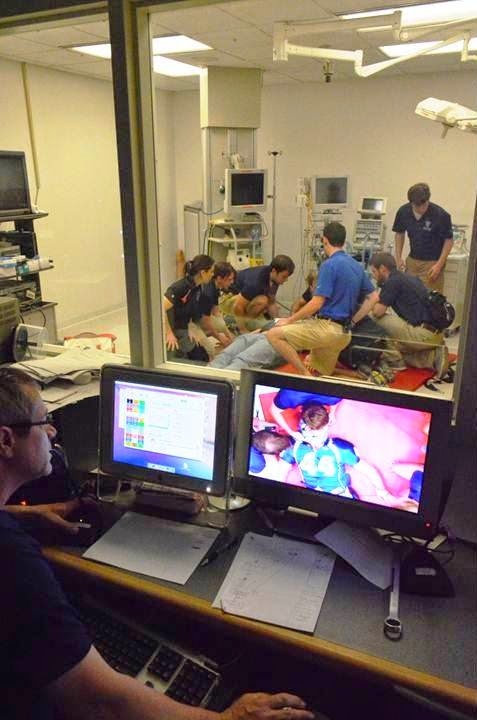 Seven person teams were responsible for determining professional roles and a management plan which they practiced in lab prior to the simulation. They were video recorded in the scenario which included a primary and secondary survey and acute management of the injury in a football player. It also included transportation of the patient using a spine board. Faculty members Kitty Newsham PhD, ATC and Katie Leible MS, ATC provided feedback and conducted a debriefing using the video with the teams after they completed the scenario. Experiences and resources such as these are invaluable in the professional development of the SLU AT students.